Gaspard Louis achieved a critical plateau last week on his trek up the mountain towards success for his modern dance company, Gaspard & Dancers. The company presented its 5th annual concert in Duke University’s Reynolds Theater, and a great deal of the potential evident in the Haitian-born Louis’ earlier concerts was realized by the company as currently configured. The program on Sept. 25-26 featured the premiere of his newly-completed L’Esprit, the final section of his trilogy concerning the devastating Haitian earthquake of 2010. Louis, a former Pilobolus dancer, has now been choreographing long enough to have found his own style, and has had the tenacity to hold his dream of a first-rate company before him as he has struggled, like all dance artists, to raise enough money to bring his vision to life. In previous years, he has relied on local and regional dance talent (which is not inconsiderable), but this time, he auditioned dancers from afar, and hired the chosen ones to work with him full-time for a solid month before the performances. The Gaspard & Dancers company premiered L’Esprit in Durham, NC. Photo: Robin Gallant. On the 25th, audiences finally saw what Louis has had in mind all this time. This was the third time I’d seen part one, Annatations, and at least the third time I’d seen the central component Souke (Shake), which I also saw in development on students at the American Dance Festival in 2012. But seeing them performed by this tight ensemble of very strong dancers was an entirely different experience. Louis demands not only strength and agility, not only lyricism and grace, but honest emotionality. His trilogy deals with matters of the spirit and those of the flesh, and is remarkably free from intellectual gaming and aesthetic artifice. Opening with the beautiful Annatations, with its watery travels and ethereal risings, moving to Souke, in which the world falls down and the beloved dead are reverently tended, and closing with L’Esprit‘s clarion call to live again, and dance, Louis’ Haitian trilogy is no slight undertaking. Both dancers and audience must open to the pain, as well as the happiness, of this life and death. Whatever your spiritual beliefs may be regarding non-bodily life on the other side of the veil, it is impossible not to respond to the life-force pulsing through the post-earthquake L’Esprit, in which the dancers light up our spirits with their joyous motion to Afro-Caribbean jazz beats and soaring trumpet. Like all successful choreographers, Louis understands that the dancing alone is not enough–the stage pictures must be powerful, the lighting must make them more so, and the costuming and any set must reinforce the dance without calling undue attention to themselves. The music must both drive and serve the dance. In the Haitian trilogy, John Kolba has devised (with Jennifer Wood on Souke) three very different lighting designs that emphasize the different states of being, and Jakki Kalogridis’ costumes are excellent, especially those for Annatations, which have a lovely relationship with Steven Silverleaf‘s hovering angels (perhaps they are arche-angels). Randall Love and Paul Leary made suitably fractured, unnerved music for Souke, and cellist-composer Joshua Starmer has made a haunting and very beautiful piece for Annatations. You can hear it on or download it from his site. All this is by way of pointing out that the collaborative skills Gaspard Louis developed as a member of Pilobolus are working to his, and our, benefit in his role as choreographer and company director. In addition to the trilogy, the concert on the 25th and 26th included Louis’s 2002 duet, Deux, which he danced with the powerful Kristin Taylor. It is rich in interesting lifts and carries, but more affecting for its nuanced look at a man and a woman in love and occasional conflict. The big surprise, though, was the opening number. In his day job, Louis is outreach director for the American Dance Festival, and in that role, he teaches part-time at Durham’s public charter grade school, the Central Park School for Children. He has worked with some of these children, now in 4th and 5th grades, since they were in kindergarten; they were joined by younger ones in Dance x 19. He taught them an adaptation of Anne Teresa De Keersmaeker’s Rosas Danst Rosas! And it was wonderful. Unlike the professional dancers who performed the work at ADF in 2011, they hadn’t had the playfulness trained out of them. 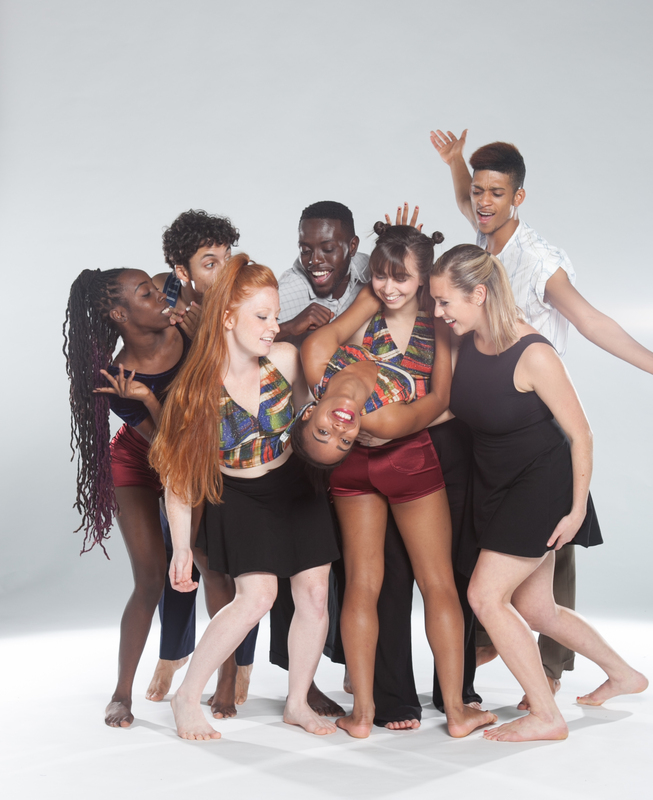 And that offers another key to Gaspard Louis’ appeal: he just won’t quit working toward his dream of a national-level modern dance company based in Durham, NC–but he won’t quit playing toward it, either. If you would like to help Louis take it to the next level, you can contribute to the company (a 501c-3 not-for-profit organization) through the website. 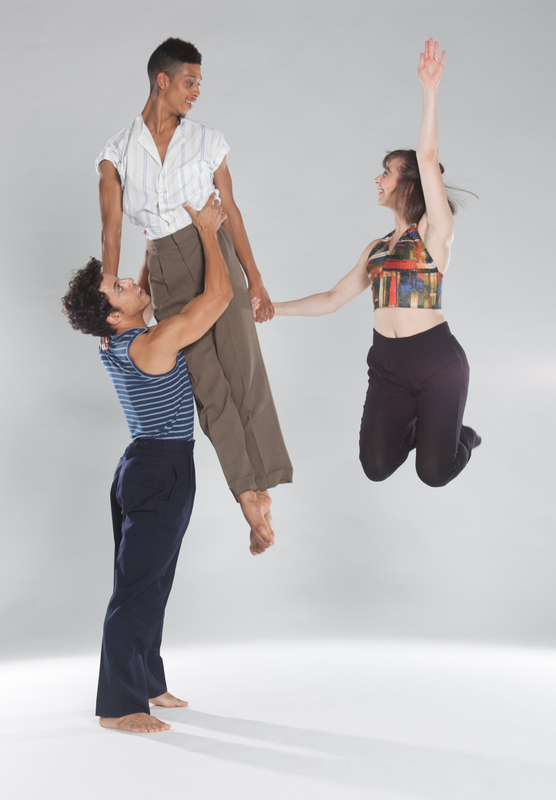 L to R: Christopher Bell, Frankie Lee, Amanda Maraist in L’Esprit . Photo: Robin Gallant. 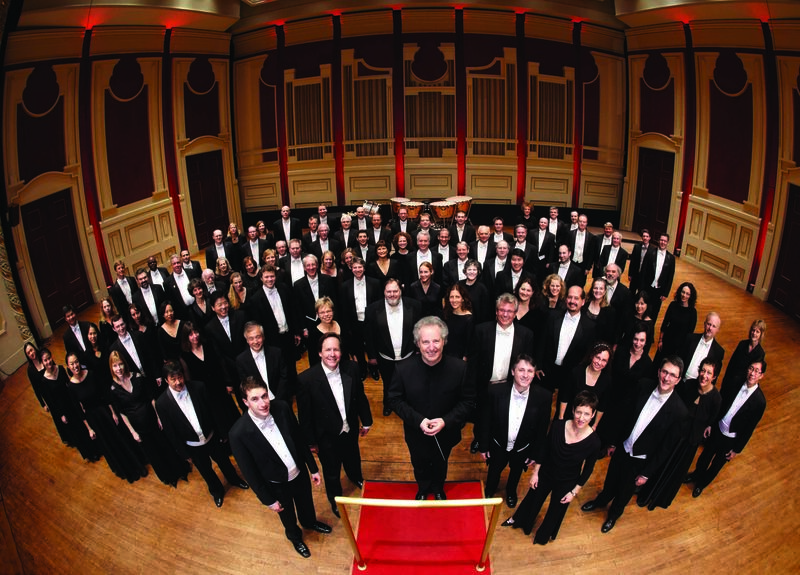 The Pittsburgh Symphony Orchestra, Manfred Honeck, Conductor. Photo courtesy PSO. I heard and saw one of the more thrilling symphonic concerts of my decades of concert-going last night. Carolina Performing Arts is presenting an unusual two-night visit from the Pittsburgh Symphony Orchestra, and the multi-faceted brilliance of the first night’s playing was clearly not an aberration. Led by Manfred Honeck, the PSO played with precision, warmth and passion a varied program that concluded with a heart-poundingly gorgeous rendition of Gustav Mahler’s Symphony No. 1 in D major. 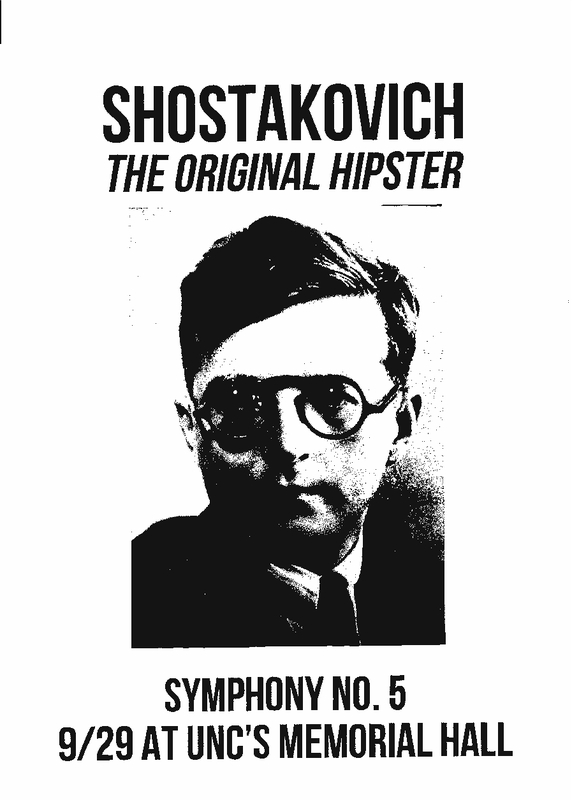 Tonight they will play a different program which will wind up with the Shostakovich 5th. If the Mahler was like riding the biggest roller coaster ever, it’s reasonable to expect that the Shostakovich will be like riding the Tilt-a-Whirl. Fasten your seat belts, kids. The program on the 28th included Mason Bates’ Rusty Air in Carolina, full of the sounds of cicadas and katydids that he learned to love in his summers at the Brevard, NC, summer music festival. It was a pleasant opener, and beautifully played, but quickly forgotten when soloist Valentina Lisitsa (who made her own path to the world’s stages via her YouTube channel) strode to the piano in a silver cloud of a dress and proceeded to play the living daylights out of Rachmaninoff’s Rhapsody on a Theme of Paganini. If you ever get a chance to hear her, sit where you can see her face. She sings to herself, and her emotions cross her face like scudding clouds and flashes of sun. The musicianly communication between her and conductor Honeck was equally thrilling. After one particularly glorious passage, she flicked her hand at him, as if saying–top that, buddy–and I think he winked. But the Mahler! Honeck, like Mahler, is Austrian, and began his career in Vienna. His interpretation of the music was so rich it set off a whirlwind of colors in my mind, and his command of the orchestra is such that each tone and texture had unusual clarity. The volumes and relationships of the various sections are carefully controlled: nothing is muddy; everything builds. And you could enjoy Honeck if you were stone deaf, his conducting style is so visually engrossing. Check it out tonight. I can hardly wait to see what magic signs he uses on Shostakovich. Swag from the CPA lobby table. Don’t know if I’d call him a hipster, but his 5th Symphony will blow your mind. Have I mentioned lately how lucky we are in the Triangle to have a very good regional professional theater at our public university in Chapel Hill? Currently, as it regularly does, PlayMakers Repertory Company is presenting a recent play in wide production around the country, which allows theater-goers here to share in a kind of dispersed national intellectual conversation. 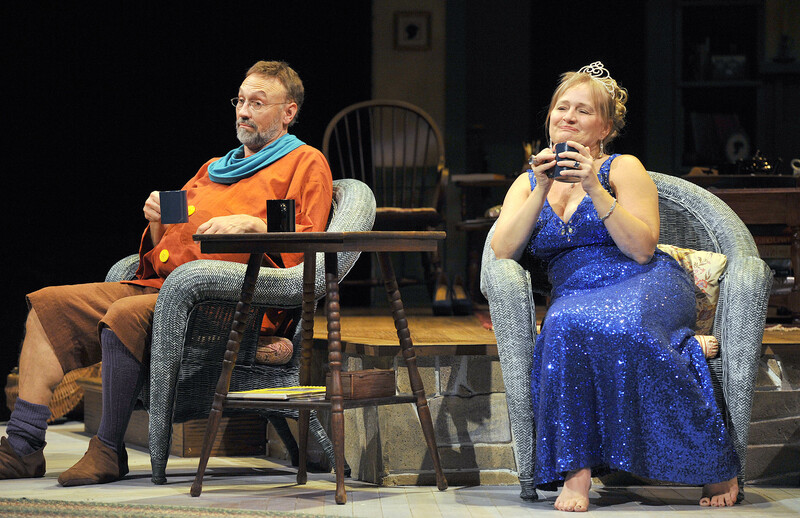 Through October 5, we are talking about Christopher Durang’s Vanya and Sonia and Masha and Spike, which won the 2013 Tony Award for Best Play, and which provides a fabulous showcase for some of the PlayMakers company’s most comic talents, and for a flashy turn from the guest artist. L to R: ARIELLE YODER as Nina, JULIE FISHELL as Masha, CHRISTIAN DALY as Spike (standing), JEFFEY BLAIR CORNELL as Vanya and JULIA GIBSON as Sonia (in background) at PlayMakers Rep through October 5, 2014. Photo: Jon Gardiner. VSMS is directed here by Libby Appel (artistic director emerita of the Oregon Shakespeare Festival), who directed an exquisite version of The Glass Menagerie for PRC a few years ago. She brings the same deft guidance to Durang’s play, ensuring that the delicate aspects of the characters are not lost in the rowdy roar of the broader comedy. Appel is undoubtedly aided in her approach by her deep knowledge of the works of Anton Chekhov: she has recently completed new translations of five Chekhov plays. The more Chekhov one knows, the more references one will catch and enjoy and correlate inVSMS, but it is not essential to know any. Two siblings, Vanya (Jeffrey Blair Cornell) and Sonia (Julia Gibson), live in the house they grew up in, the house in which they devoted the prime of their lives to caring for their infirm, demented parents. The parents are now dead, and Vanya and Sonia are marooned with their disappointments and old grievances, their tedium interrupted only by Cassandra, their semi-psychic housekeeper (Kathryn Hunter-Williams). Their successful–but now losing the battle against aging–actress sister Masha (Julie Fishell), who pays the bills, blows in with her boy-toy (Christian Daly). He sets everyone on their ears with his bold sexuality. And then there’s the ingenue next door, Nina (Arielle Yoder). Oh yes, Masha announces her plan to sell the house, and her other plan–to take everyone to a costume party. She’s brought their costumes: her brother and sister are to be two of the dwarves to Masha’s Snow White. One revolts; one doesn’t. Under Appel’s direction and with this tight ensemble the play achieves a dynamic balance between the outsized comic carrying on and the right-sized human sibling interactions, with the two catalytic outsiders to inject additional energy. Christian Daly, with his large-planed face and hyper-physique, is very amusing as the ridiculous would-be actor Spike, and his presence in the story allows for even more theatrical references to bolster all the Chekhovian ones. He makes you want to wash your hands, but lovely Arielle Yoder makes you feel like you have just washed your hands. Her character Nina may be star-struck and stage-struck, but she is an actual ingenue, and her presence is a balm to the older people. The squabbles, alliances, attacks and unexpected revelations of the three siblings always ring true, and form the more memorable aspect of the show. Julie Fishell is a marvel to behold as the fading movie star Masha: commanding, neurotic, comic, tragic–and ultimately, released from her fears, at least for a minute. Her timing, as ever, is impeccable. 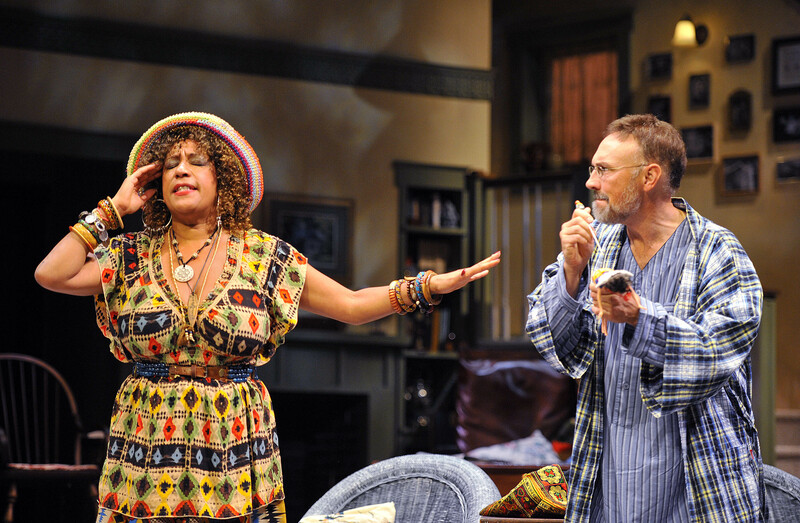 KATHRYN HUNTER-WILLIAMS as Cassandra and JEFFREY BLAIR CORNELL as Vanya. Photo: Jon Gardiner. Comic honors go to Kathryn Hunter-Williams for her portrayal of the nutty housekeeper Cassandra, who goes about in floating clothes, spouting warnings and prophecies. The scene with the voodoo doll is purely hilarious. All fans of Hunter-Williams will want to see her in this unusual role. But Jeffrey Blair Cornell as Vanya and Julia Gibson as Sonia, although they had the quieter roles, made the heart beat in the play. I’ve seen Cornell play many, varied, characters, but I had never seen him inhabit a role more fully than he did Vanya on opening night. It was a beautiful performance, robust but nuanced emotionally. He and Gibson, who has shown amazing range in the short time she’s been with PRC, interacted with a testy ordinariness that was both amusing and endearing. Gibson rather steals the show with Sonia’s transformation from dumpy whiner (“I have no life!” “I am a wild turkey!”) to a voluptuous woman who can take action. Her appearance in a blue beaded evening gown, speaking like Maggie Smith, brought the house down, but the later scene, when Sonia takes a phone call from a man she’d met at the costume party, is far more affecting. Gibson’s face expresses a trajectory of emotions leading to a tentative happiness, a surprised contentment. And in the final scene, the three siblings nestle together, sharing those emotions. Lovely. JEFFREY BLAIR CORNELL as Vanya and JULIA GIBSON as Sonia. Photo: Jon Gardiner.